386/20 MHz or higher, MS-DOS, 2 megs RAM, 25 megs hard drive space for The Black Gate and Forge of Virtue, 30 Megs for Serpent Isle and The Silver Seed, VGA Graphics, 256-colors, mouse, keyboard. 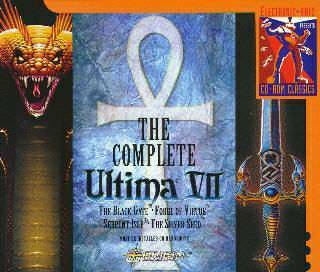 If you haven't played Ultima VII until now, then DON'T buy it unless you have tried Ultima I-VI. This is because present players like to play 3D style games like Revenant, Planescape: Torment or Diablo. You'll be disappointed with Ultima VII because it uses a 2D graphics engine, but you can interact with virtually every item in the game. Origin sells the Ultima VII: Complete Edition which includes Ultima VII: Black Gate with Forge of Virtue and Serpent Isle with Silver Seed add-on. However, it is far better than Ultima VII in terms of graphics, storyline and gameplay. In case you don't know, Ultima VII was released before 1996, so think how the game would be. To get a better idea, view the screen shots for Black Gate and Serpent Isle. Serpent Isle has a built-in frame limiter that makes it possible for fast computers to run this game in the normal speed. However, under modern OS's, and especially PCI sound cards, getting this game to run can be a headache if you don't use the new utility a fan developed to run the game under Win9x..